I have learned in my life that “it is always darkest just before the dawn.” Last week was so dark. I sat watching “with fear and trepidation” as the Republicans threatened to end healthcare for 16 million Americans. Even as I supported efforts to stop them, I felt like the freight train was running out of control. Then, Hawaii Senator Mazie Hirono stepped up to speak on the floor of the U.S. Senate. Every time I watch her speech, I am moved to tears. Her courage in sharing her story, including her fears, her family’s struggles, her unique path to the U.S. Senate, all of it. The shining sincerity of her compassion is so beautifully overwhelming, born of her uniquely American experience. Raised as a poor Japanese immigrant, she has never forgotten where she came from. Her call for compassion, I believe, is what sealed the deal. As we all know, Senator John McCain‘s “no” was the deciding vote, following the tie-making opposition of Republican Senators Susan Collins of Maine and Lisa Murkowski of Alaska. Why is compassion so compelling? Compassion is not simply a human emotion. There is evidence that animals are also quite capable of giving and receiving compassion. We also know that compassion in animals is not limited to animals of their same species. A dog can show kindness to a cat. A mother hen can adopt a lost baby duck. A lion can hug a man who loved him without harming him. It seems that in the natural world, compassion has no bounds. It seems that we are all capable of giving and receiving compassion. The response to Sen. Hirono’s empassioned plea to vote against repeal of Obamacare suggests that we are all vulnerable to the message of compassion. Sen. Hirono noted that when she was diagnosed with cancer, even Republican senators expressed their concern for her. They showed her kindness and compassion. 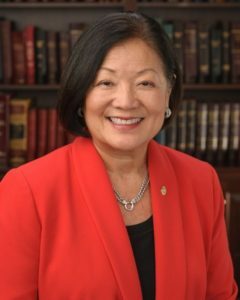 Sen. Hirono called upon the Republican senators to show Americans the same compassion they had shown her. And it worked. We should not overlook the significance of the courage displayed by two other female Senators, Susan Collins of Maine and Lisa Murkowski of Alaska. No. 45 actually threatened the residents of both of their states to retaliate against the Senators. Whereas some Republican senators caved in to pressure from the Trumpster, Senators Collins and Murkowski stood firm and represented their constituents. Their votes demonstrate that when courageous women are present in positions of power, the conversation changes. But for the courage of Senators Collins and Murkowski, Sen. John McCain would not have had his historic opportunity to say “no.” In voting “no,” Sen. McCain also stood fast to represent the best interests of his constituents in Arizona. For the first time in my life last weekend, I was “proud” to be in Arizona. 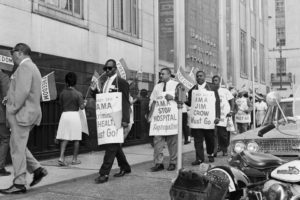 Healthcare in America has been denied and fought for like every other civil right. President Barack Hussein Obama was inspired to make health care his signature piece of legislation. Indeed, arguing for health care reform in 2009, President Obama cited the death of his own mother from cancer and the challenges she faced obtaining insurance because her cancer was deemed a pre-existing condition. His mother, Stanley Ann Dunham, was a White woman. To learn more about the fight to provide healthcare for all, go to HealthyCalifornia.org or Citizen.org or NationalNursesUnited.org. Also check out Healthy California’s latest video.